The eldest son of the Count of Bollstadt, Albert was born in the family castle on the Danube in Swabia, Germany. At the age of 17, he turned his back on wealth and a life of nobility to join the Dominicans, despite family opposition. 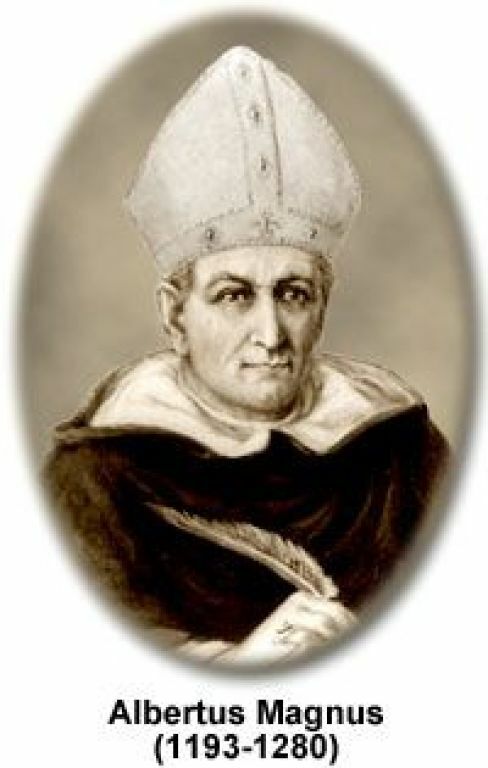 While leading a very active life as teacher and administrator, as bishop of Ratisbon he tramped the roads of Europe on long journeys and was nicknamed the bishop with the boots. Yet his printed works, which were mostly completed during this period, fill 38 volumes and cover every field of learning. He was considered an authority on physics geography (one of his treatises proved the earth to be round), astronomy, mineralogy, zoology, chemistry and biology. Legends grew up that he had used magical powers. He wrote as well on logic, metaphysics, mathematics, the Bible and theology. He pioneered the Scholastic method – a philosophical system that emphasized the use of reason in exploring questions of philosophy and theology – which was later perfected by his student and friend Thomas Aquinas. St. Albert’s own contemporaries dubbed him “the Great,” recognizing him as “no less godlike in all knowledge,” the “wonder and miracle” of their age.